“Weak Monument,” Estonian Pavilion at the 16th International Architectural Exhibition of the Venice Biennale. Photo by Tõnu Tunnel. In 1923, in the Estonian village of Torma, a statue of a kneeling warrior was put up to confront the East. When the East came a few years later, the statue was turned to face the West, who then came and turned him around, followed by the East, once more, who made him face the West, before blowing him to pieces. In Estonia, monuments dance. Gliding past the debate over the appropriateness of monument removal, the question becomes, what is left when monuments are gone? For curators Laura Linsi, Roland Reemaa, and Tadeas Riha, the answer is found in the everyday features of the Estonian built environment: the ubiquitous pavers found in public plazas, the hardened vertical circulation core of the typical Tallinn apartment building, a staircase in Hirvepark. Their alteration of the former baroque church Santa Maria Ausiliatrice transforms a strong monument into a weak one. 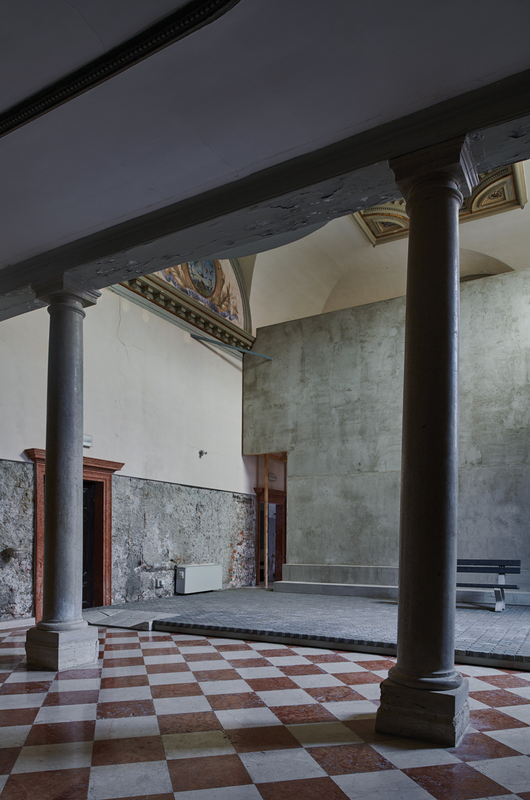 It breaks down the interior’s hierarchy by raising the floor to the level of the altar and concealing the altar’s carved figures behind a skim-coated wall fronted by a park bench. The altar can still be viewed and appreciated by passing through a threshold in the wall, if that’s what you wish. It’s your choice. After all, this is a weak monument. Texas still has 68 Confederate monuments. Who’s to say how much longer they’ll last? In the meantime, we might as well start thinking about which weak monuments we value. I’ll offer up one from my little city: the Barton Springs Pool. How about you?